Cafe on the Square, an unassuming cafe opposite the University of Maryland Hospital, has become my go-to place for a quick lunch. 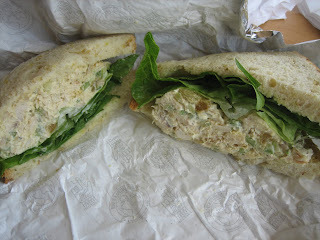 First of all, take a look at that picture - that's their regular chicken salad ($4.99). That is a LOT of chicken salad!!!! I got it on their signature sunflower seed bread (which tastes as good as it sounds) with golden raisins, celery and mayo. I ended up eating half and keeping the rest for the next day's lunch because of the large portion. It was VERY hard to stop eating, but I tried to think of how happy I would be the next day as I slowly wrapped up the second half. I've tried The Bawlmer sandwich ($5.69) - Lean corned beef brisket, provolone cheese and grey poupon mustard on Rye bread. This was a liiiitle too boring for my taste, but the meat was great, so I really can't say anything bad about the sandwich - it's my fault for picking something like this. I've also tried their Turkey Powerhouse sandwich ($5.99) - turkey, lettuce, tomato, alfalfa sprouts, muenster cheese and honey mustard on the sunflower seed bread. This breathes a little extra life into a normal turkey sandwich. Be aware that muenster is a pretty overpowering cheese - so make sure you like it! My favorite meal to get there, however, is their Pasta Nicoise ($5.99) - White tuna, capers, black olives, snow peas, Parmesan cheese, mayo, basil and a lemon-herb vinaigrette dressing. I would literally devour that everyday if I could (and if I didn't care about Mercury poisoning). This is the best tuna pasta salad I've ever tried. Yes. That good. I love the sweetness of the dressing and the crunchiness of the snow peas that matches well with the soft tuna. You can order it in the normal size (which is served on a bed of lettuce), but check to see if they have it in their side salad size as well ($2.19). I personally find the side salad enough for a lunch if I have something small on the side (yogurt/cookie/fruit). Speaking of which, they also have yummy baked goods as well - I got a thick chocolate chip cookie the other day and was perfectly happy with it. They don't have all their pasta salads in the Cafe everyday, so if you're going for something particular, call to find out if they have it that day. Or just stop by and grab another one anyway - I've heard great things about the Neptune's Delight pasta salad ($7.29) - jumbo shrimp, crab meat, fresh veggies, scallions and their lemon herb dressing. I think that will be next on my list! Yum, I'll have to try it out! So you find muenster overpowering? I think it's one of the mildest, milkiest cheeses out there. The American stuff. However, French Muenster is powerfully, gaggingly, stinky. While I generally like Cafe OTS, I find them a bit pricey. And their meats and breads are too dry for my taste. I do really like the pasta salads, though, especially Carnival pasta, Neptune's Delight, and Spinach pasta (my favorite).